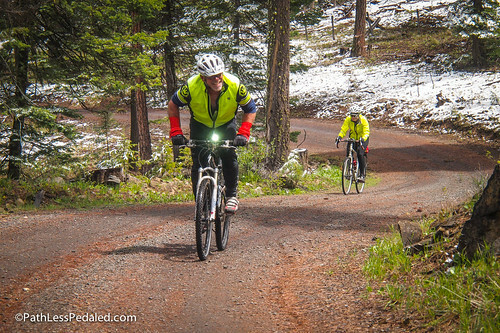 You know the state you live in is serious about bike tourism when it has a dedicated “gravel working group,” whose mission is to catalog and figure out how to promote its thousands of miles of gravel roads. 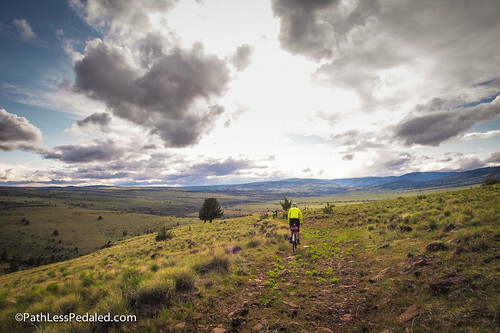 This past weekend, we made the trek out to John Day, in Eastern Oregon; where Mike Cosgrove, one of the region’s most passionate rural bike advocates, wanted to show us a fraction of the thousands of miles of non-paved and mixed-terrain riding opportunities in the area. We went out there with a member of Travel Oregon’s destination development team and a marketing person from Chris King to see what the region had to offer. Mike Cosgrove, rural bike provocateur, standing by his magic bike bus. 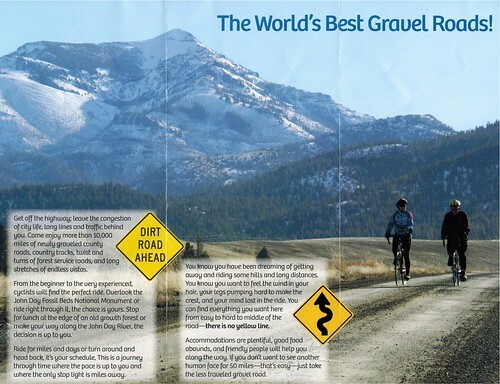 Mike, always one to take initiative, created a brochure advertising the 10,000 miles of gravel roads that can be found in the John Day area. Before we get to the gravel, this bus / #adventuremobile deserves mention. 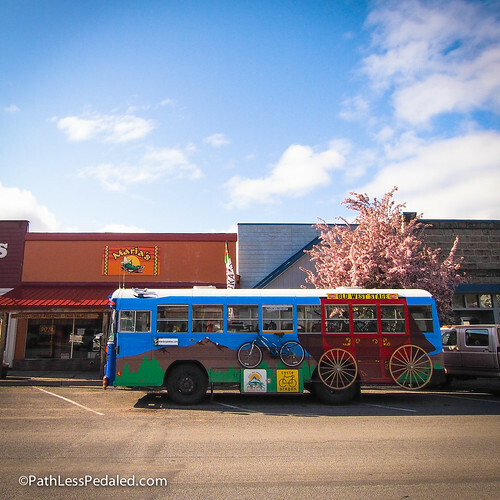 It is an old Blue Bird school bus transformed into a crazy multi-colored Ken Kesey fun mobile, if Ken and the Merry Pranksters rode bikes. Definitely not what you’d expect to find out in Eastern Oregon. On the outside of the bus is a bright mural of mountains and rivers with a few wagon wheels and half a bicycle thrown in. 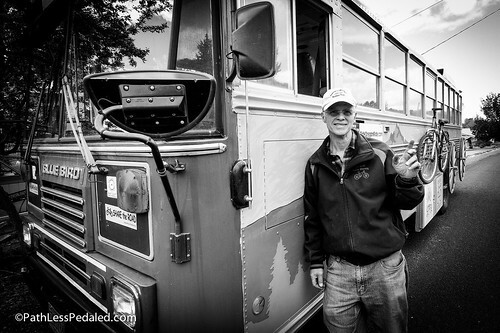 When Mike isn’t shuttling some bikey ne’er-do-wells from Portland out into the middle of the forest, he uses the bus for rural Safe Routes to School and bike education programs. How’s this for an #adventuremobile. 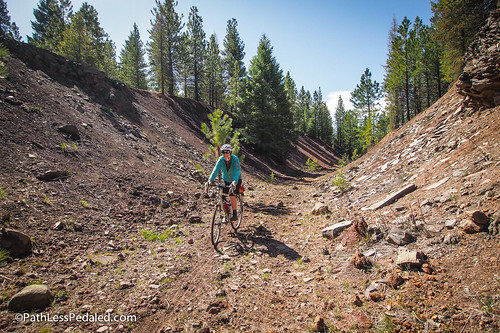 Our rough plan for the weekend was to have a mini tour de gravel in the John Day area. Mike had proposed three routes of varying lengths and difficulties over a multitude of riding surfaces, to figure out what sort of gravel riding would be best suited for cyclists. 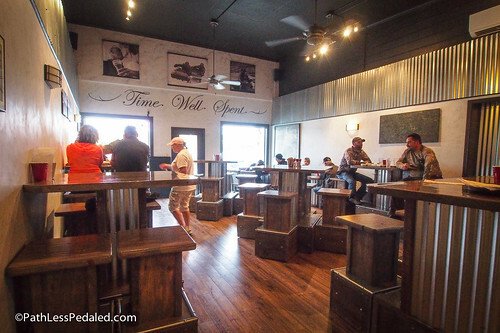 We arrived in the afternoon on the first day and had lunch at the diner in Dayville, with three local cyclists who looked at us with some skepticism when we told them that riding off pavement was a thing. After lunch, we all hopped into the bike bus and Mike drove us up some delightfully empty paved roads until we hit some gravel. We unloaded the bikes and immediately put on some warmer clothes. We had gained a lot of elevation and the sky was looking somewhat ominous. 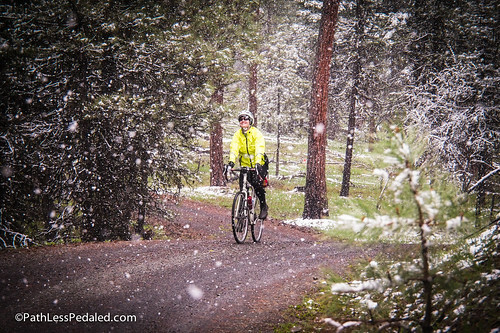 What was drizzle down in Dayville had transformed into “graupel” at elevation, round icy pellets falling from the sky that had the knack of hitting you in the face. Thankfully, the first part of the ride was all uphill which gave us a chance to heat up and keep warm. 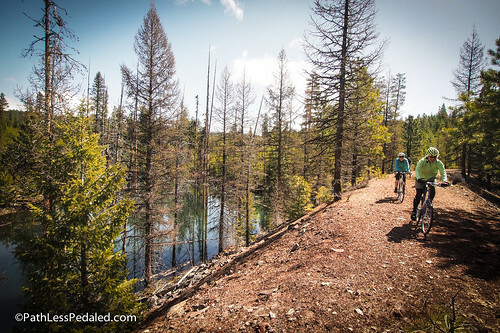 The riding was really a picture perfect stretch of what you would expect for gravel riding in Oregon’s many forest service and logging roads. Low traffic. Unpaved and gravelly but a highly rideable surface. The road also offered peeks at the surrounding mountains and valleys when the weather cooperated. Dylan, from Chris King, enjoying one of the sweet early stretches of gravel. The road descended and we were met by Mike and the bike bus at the bottom of the hill. The next part, we were warned, might be a little bit muddy, especially with the recent storm. We were having such an awesome ride the last few miles, that we wondered how bad could it be? It turns out, pretty bad. We pushed on, past a gate to a road that was no longer maintained. The first quarter mile or so was mushy but rideable. We were in an obvious low part of the terrain judging by the small swimming pools that were forming in the middle of the “road”. About a mile in, I noticed my tires had apparently lost all traction. The mud was so thick and sticky that it clogged up the treads on my tire and I was essentially riding a 29+ mud tire slipping and sliding all over the place. At one point, while avoiding a rock, I slipped and fell on my side. At least the mud was soft-ish. That time when all our bikes communally exploded. At about mile two I rounded the corner and saw everyone standing around a bike in pretty sad shape. Harry’s derailleur had thrown itself into the rear wheel (perhaps to save itself from the muddy hell we found ourselves in) and broke a spoke and bent his derailleur hanger. 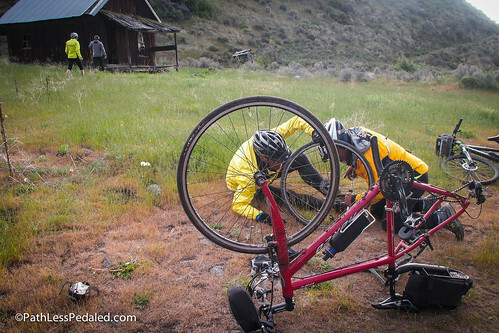 While Harry and Dylan tried to bend the frame back into rideable shape with the help of a Leatherman and good ‘ole brute force, I tried to unclog my bike. The mud was so bad at this point it verged on comical. I literally couldn’t push my bike any further. The mud hung in fist size globs at both my brakes, beneath my rear fender and on my rear derailleur. I removed my rear fender and strapped it to my rear rack for the rest of the ride. This, of course, brought up an interesting lesson about gravel roads and attempting to market them for general consumption. Gravel roads (at least in the PNW), unlike paved roads, have a seasonality. At certain times of the year, the riding is more manageable. During the wetter months or after a storm, you had better be prepared for a long walk in the woods. Also, the word gravel is such an inadequate descriptor for the range of surfaces you could encounter (everything from pea size stuff on up to chunkier loose pieces and the occasional baby head). Another huge consideration, which was staring us at the face at the moment, was that gravel roads are remote and people riding them must be fairly self-sufficient if something goes wrong. This became really obvious as we tried to call Mike and the magic bus and got no signal. We huddled and decided that it would make more sense to push on and continue on with the plan. We had about six miles until we got to a deserted ranch and from there we would be on more rideable roads. What’s six miles anyway?! From mud to sharp pointy boulders, but the scenery was worth it! It was slow going for another mile or so and a fair amount of cursing under the breath. It was obvious that we were pretty under-gunned for the terrain, but the saving grace was the absolute beauty of the place. After leaving the low muddy area, we were on a high rocky ridgeline that we were pretty certain no bike had traversed in a really long time. The terrain was the polar opposite of what we had just experienced. Instead of the road surface being softy and muddy, it was full of fist-sized rocks and mini boulders. While we were able to pick through it all with our more road-oriented bikes, the general consensus was that it was verging on cross-country mountain bike territory. After the ridgeline, we descended to the aptly named Murderers Creek, probably because of the “bridge” we were going to cross. With some good old fashioned teamwork, we moved the remaining boards of wood into something slightly less treacherous and formed a bucket brigade to bring bikes and riders across one at a time. From there, we pedaled a few more miles to a rather picturesque abandoned ranch where bike tires began to puncture left and right. It was as good a time as any for a break. Totally not sketchy at all. At this point, it had taken us two hours to go six miles, and the sun was rapidly descending. Another lesson learned is that normal mileage/time computations for paved roads are useless. The six miles we just rode weren’t particularly hilly, but the combination of mud, rock and other obstacles brought us to a crawl. After another river crossing (this time a lot less treacherous, but the water was freezing! ), we pedaled hard to where we were suppose to meet Mike hours ago. There was a bit of urgency during the last five miles to get to the bus before it got dark, but the setting sun along the cliff wall and the smoothest gravel we’d seen in a while made it hard not to appreciate the beauty of it all. By the time we reached the bus, we were all ready for a beer. There was a lot of toasting and laughing and the smiles of people who had just narrowly escaped what could have easily been a bad time. On the bus ride to John Day, the consensus was that the route today was definitely an adventure, but should it be something promoted to other cyclists? After the first eventful day of riding, Mike and the local cyclists took stock of their routes and re-evaluated where we should ride next. One day took us through a series of beautifully rideable forest service roads up to a fire lookout. Even though it was cold and we got some snow, it seemed like a piece of cake after the ride the day before. Jim, a local cyclist in Prairie City and avid bike tourist, powers up a hill in the Strawberry Mountains. On the third day, we rode along the cinder surface of an old railroad grade. It was a little soft and rocky in parts, probably more the terrain of a mountain bike than a traditional touring bike, but still very rideable. It wound through the forest and crossed over creeks that filled in large holding pools of water. The route then joined up with some more logging roads and back to the main paved road where we saw only one other car the entire day. Riding along a rocky old railroad grade. A few creeks formed large holding pools of water along the railroad grade. 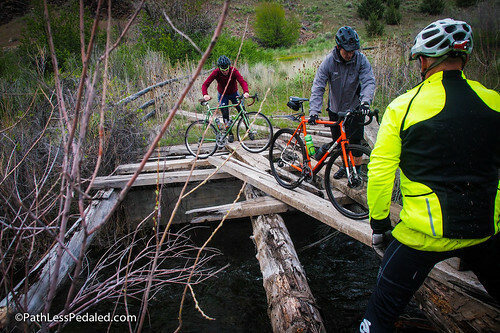 After three full days of riding and learning about the area from local cyclists, our heads were exploding with all the possibilities of mixed terrain riding out in Eastern Oregon. 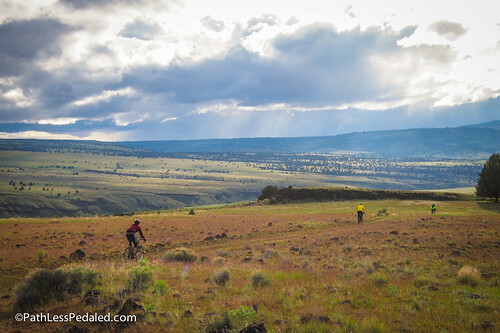 You could probably basecamp in John Day and spend three weeks riding in the area and barely scratch the surface of what was out there. There is everything from quiet paved roads, to remote forest service and logging roads, to stretches of right of way that would barely qualify as a road! The challenge from the gravel working group’s perspective is to make sense of it all. What would be fun for one rider would be hell for another. Do you classify riding surfaces with a number system or minimum tire width recommendations? What percentage of a ride must be gravel for it to be considered a gravel ride? How do you adequately communicate how remote these areas are? 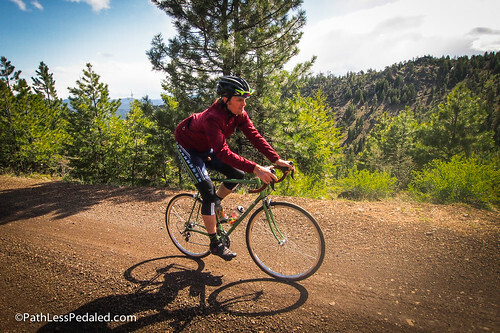 How do you deal with the seasonality of gravel roads? We came away with as many questions as we did answers, and it forced us to really examine, from a bike tourism perspective, what would be a good route that you would want to promote. All’s well that ends well. Trying beers at 1188, the new micro brewery in John Day! 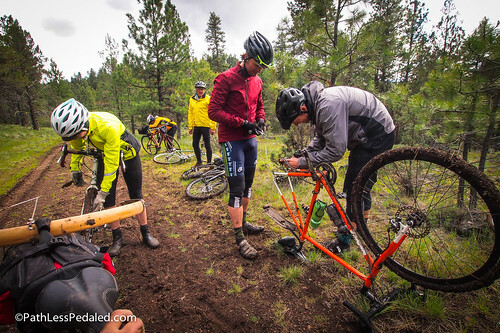 By the end of the three days, we were excited by the possibilities of mixed terrain riding in Oregon. Oregon has some great paved roads; but if you add the forest service roads, publicly accessible logging roads, gravel roads and everything in between, the potential network is really mind blowing. 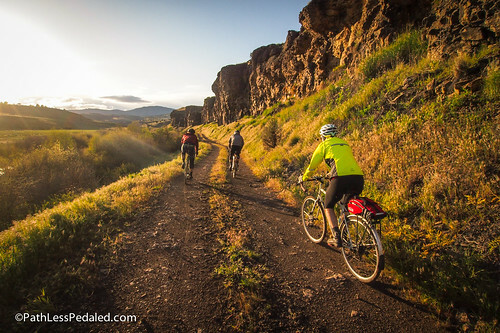 The gravel working group is still defining its role and trying to figure out how to make sense of it all and what best practices would be; but whatever happens, our eyes have definitely been opened to fun and challenging new routes in Eastern Oregon that we will have to return to ride. Enjoyed the article very much. With thoughts of “Been there, done that!” coursing through my mind. Now, at 83 & confined to only a road recumbent in our “mobile-home” life style, my 10″ front wheel would have a good deal of trouble with that back country riding shown and described. That’s really cool, and that area looks beautiful. Great review, and pics! Happy to hear that you will return. Nice to see John Day in a better light. Working forestry there in the late 90s was scary and grim….major unemployment, major meth problem, raging hostility from hillbilly locals. It’s always been beautiful, vast country…thank goodness it’s coming back around!